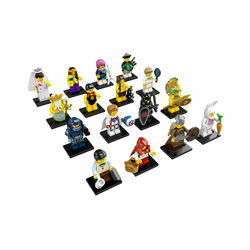 8831 Minifigures Series 7 is the seventh series of Collectable Minifigures. It was released in May 2012. As with all the other series, this one has minifigures based on television, movies, video games, and townspeople that cannot be found in regular sets. This series introduced sixteen new parts and used ten from previous series. The colour for the bag for this series is scarlet red. This series has the most printing on any other minifigure series. As with Series 3 through 6, the polybags are bump coded, meaning that the bottoms of the bags have a series of bumps that form patterns. Each minifigure has its own unique code, which helps collectors figure out what minifigure is in each bag. Facts about "8831 Minifigures Series 7"